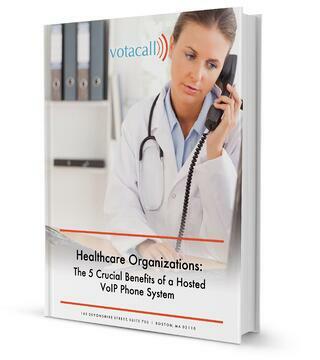 How Can Your Healthcare Organization Benefit From VoIP? In terms of high-pressure jobs, few professions can match the intensity of those in the Healthcare Industry. And given the shifting paradigms of the last few years –– including constant technological adaptation, high regulatory standards and patient expectations, and the need to maintain a sound reputation –– healthcare professionals need every advantage they can get. Fortunately, switching to a Hosted VoIP System can provide any healthcare facility –– from doctor’s offices and treatment facilities, to hospitals and labs –– with essential services that they’d otherwise miss out on. A traditional landline option just can’t compete with what VoIP has to offer. That’s why healthcare organizations across the country are switching over to a VoIP system. Save Money Without Compromising Quality –– So you can ensure the best possible treatment for your patients without breaking the bank in the process. Gain all the features VoIP has to offer and experience substantial cost savings at the same time? It’s a win-win! Enhance Patient Experience –– Now more than ever, healthcare organizations need to stay cognizant of the patient experience at their facility. With a Hosted VoIP system, you can ensure that your patients feel all of their needs are being catered to. Provide Seamless Internal Communication –– Every business could benefit from increased cohesion between team members. But in the healthcare industry, it’s absolutely vital that your doctors, nurses, and staff stay on the same page. With VoIP, you’ll never get caught off guard again. Bolster Productivity –– One of the best features of VoIP phones is that they allow your staff to focus on work –– rather than on dealing with outdated phone technology. Switching over to VoIP means equipping your team with the best possible tools to get the job done. Offer Unmatched Security and Protection –– VoIP systems are designed to take the pressure off individuals in stressful professions. And you’ll never have to worry about your VoIP system being compromised, going offline, or failing during a power outage. When you need it most, you can count on VoIP! Plus, you’ll learn how VoIP systems keep you connected from remote locations, so that you can stay in touch with important contacts no matter where you are. Plain and simple, a VoIP system will improve the way your healthcare facility operates. And remember, it’s as cost-effective as it is transformative. Need more convincing? Then go ahead and download a free eBook by filling in the brief form to the right. You don’t have anything to lose –– but you’ve got a heck of a lot to gain!